42.5 in. overall, 29.5 in. blade, 11 in. handle. Purchased this sword. Came one day early. Unboxing it the presentation box was in great condition (which I was worried about) with latches in place and seemed somewhat sturdy. The spine seemed somewhat fragile so don't test it. Everything else blew me away and was first rate. 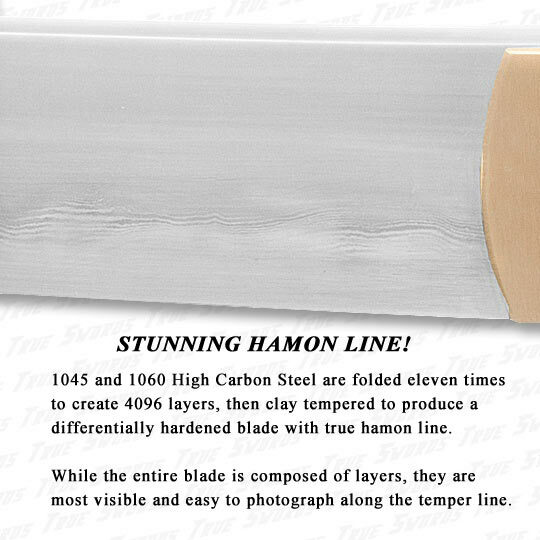 The hamon line. The sharpness to the smoothness of the blade. This thing is a work of art that just happens to be a real katana. After wiping down the blade of excess oil and putting a little shine on some other parts it made the thick immovable cardboard box it shipped in look like it would've torn in a light wind. 5 stars is toi low for this. As was pointed out by other reviews, the presentation box that the sword comes shipped in isn't the sturdiest material. However, should you take care in moving the box around, it's fine, and the case itself IS functional as a part of the display or for carrying the blade concealed. Onto the sword, though, I quite like it. For $200, it feels sturdy, and it looks pretty good too. Can swing it without worrying about it falling apart. The sword is a bit stiff in terms of taking it apart. I had a hard time getting the blade and handle to separate, but that's probably for the better. I only keep the sword for collection, so I see no reason why I should need to dismantle it for maintenance outside of routinely oiling it. One other thing I spent some time on was the brass accessories of the katana. They were all very tarnished, but with some microfiber rags and a bottle of Brasso, I was able to clean and polish them to a really nice shine in about 15 minutes after letting the brass pieces sit covered in the stuff overnight. 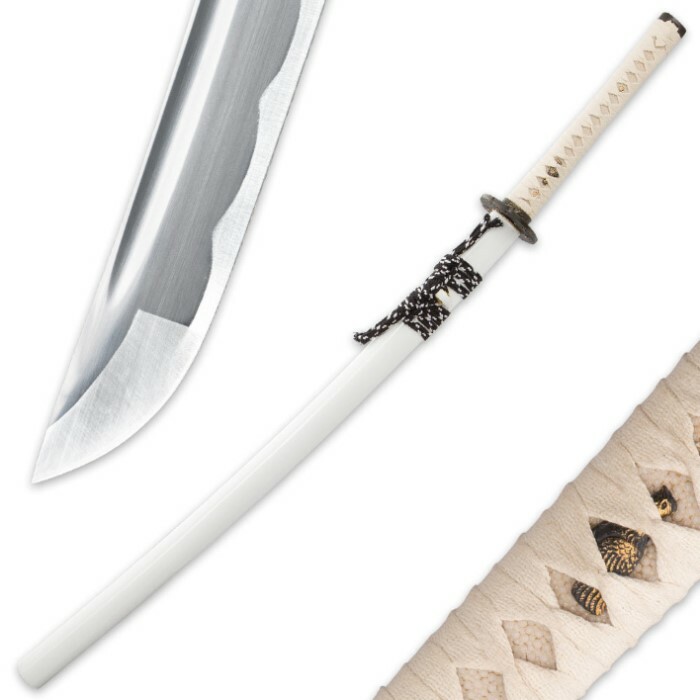 Overall, a nice purchase for someone who isn't looking to spend an arm and a leg for a decent quality katana. Bought this a while ago, decided to wait on review. This sword performs exceptionally well, especially for its price point. I would rate it as a medium cutter, but it can clear hard target's as well. I have used mine on 3" tree's with no problem. not very long ago my girlfriends grandfather called us and asked us to come and sawzall a couple deer heads off, i took this Katana instead. 3 deer heads and a hind quarter split later i have 2 tiny dings in the blade, it was my own fault i swung wrong, but the blade did VERY well it cut flesh and bone with almost no resistance. for $200 you can not find another blade this good. my ONE problem is that tear down is very difficult, the tsuba did not want to come off or go back on, i managed with the help of a wood block and hammer, but i cut myself in the process(thankfully not very badly), so be careful. I was totally unprepared for this sword. I opened the display box and the sword was wrapped in a sword bag. when i took the sword out of the bag, it took my breath away. This sword is BEAUTIFUL. I can't find anything not to love about this sword. It comes very sharp. It is a true work of art. i highly recommend this sword to anyone that wants a true one of a kind sword. It is the centerpiece of my collection. The sword is nice, the layered steel and the harmon line give it a impressive visual presentation. However the display box is total junk. The cloth was loose in several places and revealed the Styrofoam used as filler. If you intend to give this item as a gift be prepared to repair the presentation box or to completely make another. Sad to see that the sword does not have a groove. This has lowered my satisfaction for the product. 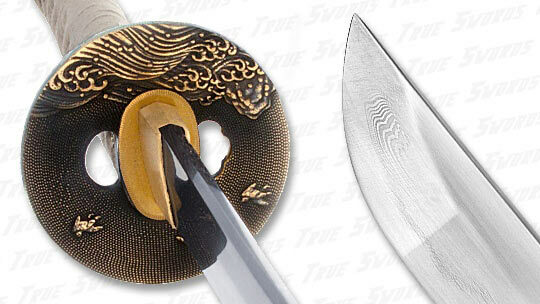 I have ordered 3 katanas from budk now, unfortunately one had to be returned due to rust on the blade. My first one good sword for what I spent on it but its no real katana, fun sword though. 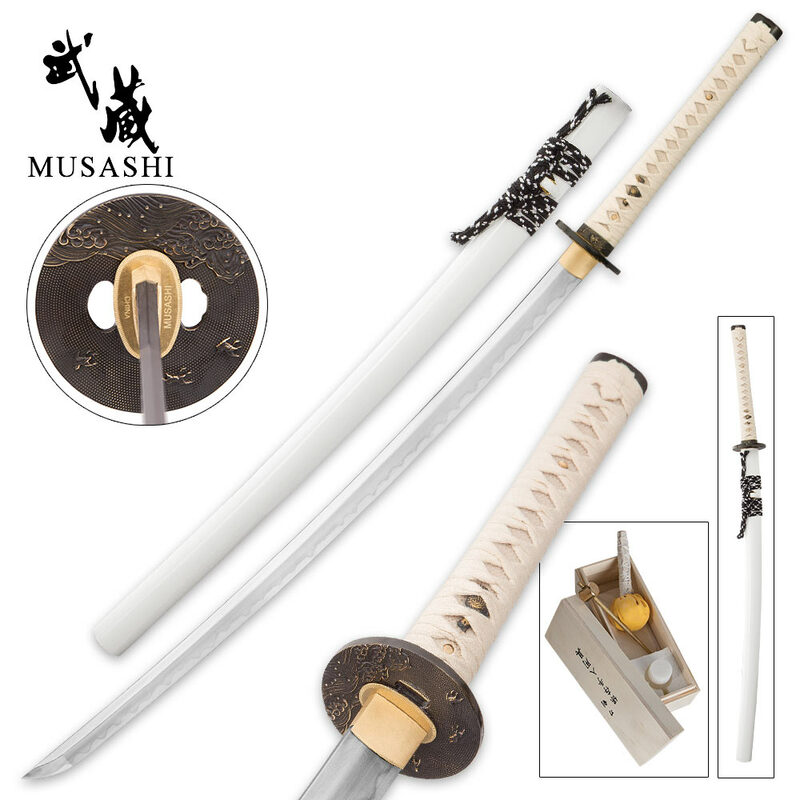 But this musashi falcon katana, I was very impressed and surprised about the quality and sharpness of this sword. 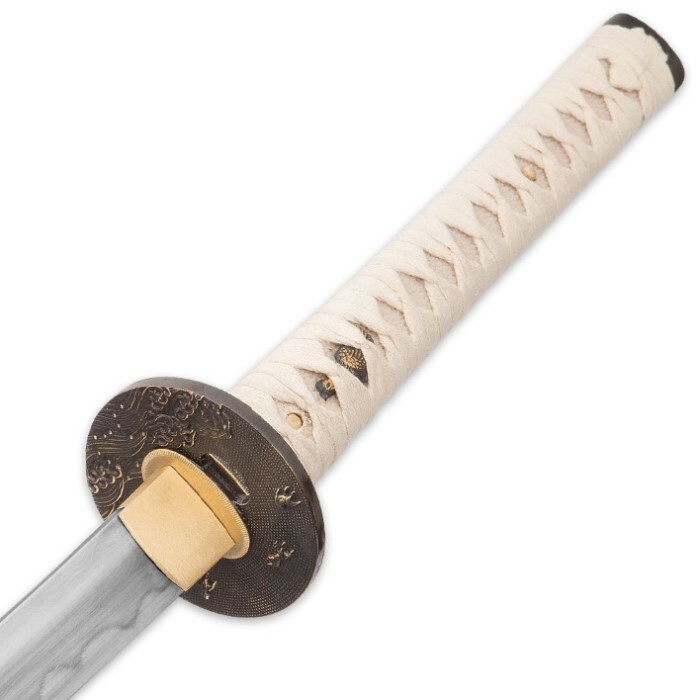 It is 1045 & 1060 carbon Damascus blade with the true hamon line the feel of this sword makes me feel like an ancient samurai warrior the blade effortlessly slices through anything you throw at it. Not a big deal to me but it is not in the description that this sword does not have a blood groove but I could care less about that when the overall quality of this blade is just flawless. You will not regret this blade it is well worth the 200.00$ you won't be disappointed. I just got this sword in today I ordered from Canada and took about a week to get here, but its well worth the wait and money. This sword is really well done and even comes with a nice box and cleaning kit I have no dents on the sword or sheath but the box was damaged on the bottom from shipping. (Tsuba broke through the bottom) The blade is very sharp and very straight this is my first real katana I defiantly not my last.